Check out our newest resource, the Shared Use Playbook. It compiles many of our tools and resources for formalizing shared use agreements into one comprehensive guide, highlights real-world examples, and discusses the benefits that shared use can have for community health. At ChangeLab Solutions, we believe that shared use is a winning strategy because it maximizes the use of public resources to benefit the community as a whole. Ready to get started? Skip to our resources and publications. Communities across the country are seeking safe, accessible, and affordable places for children and their families to exercise and play. Public schools have a variety of recreational facilities—gymnasiums, playgrounds, fields, courts, and tracks—where people can engage in physical activity. In low-income communities, schools are often the only place to find safe and affordable recreation facilities. Unfortunately, these spaces are often locked and inaccessible to the community during non-school hours due to concerns about resources, maintenance, security, and liability. The good news is that schools and other public agencies are embracing shared use as a strategy to create more opportunities for physical activity. 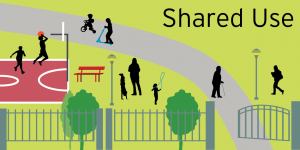 “Shared use” – also called “joint use” or “community use” – occurs when government entities, or sometimes private, nonprofit organizations, agree to open or broaden access to their facilities for community use. Shared use can take place on a formal basis (based on a written, legal document) or on an informal basis (based on historical practice). School districts and other municipal entities increasingly recognize that providing access to existing recreational facilities is one of the most promising strategies for building more opportunities for physical activity. In an era of budget shortfalls, maximizing access to existing facilities – rather than developing new ones – can be an efficient and economical use of public resources. Watch our short video, which gives a quick but vivid picture of how shared use can help your community.